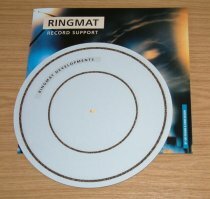 Launched in 1992, RINGMAT was then a new method of record support and the first that had been properly designed for the generation of an accurate, low distortion signal. 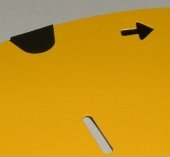 Its unique design enables 12" records to be supported so that the main vibrational modes of record movement - caused by the input of stylus energy - give the minimum possible error signal. This allows for improved tracking and, as a result, a reduction in stylus and record wear. Currently available in two main thicknesses, RINGMAT is a direct replacement for most felt and rubber mats on leading turntables, as well as all bare platters, including those made of acrylic and glass, provided they are flat. 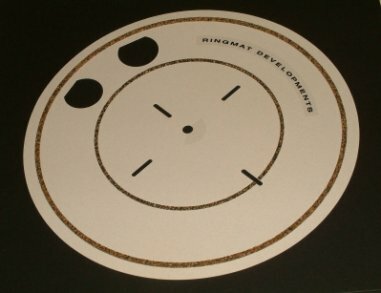 Remember, the Ringmat was designed for the acrylic platter of the DNM ROTA turntable, initially using a Linn LP12. Click here to read 'The Story of Ringmat'. To view images of the current Ringmat range please click here. Except in the case of those few turntables that normally have an extremely thin rubber or felt mat and have no tonearm height adjustment, it is recommended that the new Anniversary Gold Spot “Real Ale” version, Anniversary 330 or 330 MkII XLR should be chosen. Accordingly, Linn, Roksan, Rega and similar turntables should use one of the aforementioned Ringmats. 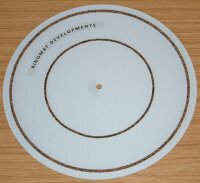 If in doubt consult your supplier or Ringmat Developments as to which thickness you require for your turntable. Nearly six years later, in August 2007, we introduced the Anniversary Gold Spot Ringmat. Here we introduced a more advanced, and thinner, adhesive, thereby further reducing the layers of substance between the cork rings and the paper substrate to provide an even more “immediate sound” when playing LPs. We also introduced a new concept in sound technology in the design and manufacture of the “Gold Spot” itself, which has incredible beneficial results in sound reproduction. Initially, it is being used just for the Anniversary Ringmat, but in due course it will be used with other Ringmat products. Fortunately, we still have some stocks of the original Anniversary Ringmat paper and also stocks of the same Ringmat paper but in a blue/grey colour instead of the buff coloured paper we had been using. The blue/grey paper is slightly thinner than the buff coloured paper (by about 0.030mm) and will in future be used for the Ringmat 330 MkII XLR; also for the Ringmat 200 (which will now be 2.4mm thick) and the Ringmat 250 (which will now be about 3mm thick). If we come across suitable thinner paper to enable us to make thinner 200s and 250s, we will do so. Once adjustment has been made for the very slight reduction in thickness of the blue/grey paper, the sound of the XLR is identical to that in recent years using the earlier buff coloured paper, whilst the performance of the new Ringmat 200s and 250s is greatly improved, not only by the use of the better quality paper but also because of the use of a better and thinner acrylic adhesive. So all round, the quality of the Ringmat range has now vastly improved. The overall thickness of the ANNIVERSARY RINGMAT is similar to other 330 MkII models and therefore the advice given in respect of the cartridge and tonearm alignment when using them should continue to be followed with the ANNIVERSARY. For those users who have not previously used a RINGMAT, the instructions given with the 330 MkII and MkII XLR models are reprinted below. For many record lovers, it may be sufficient to just replace an existing felt or rubber mat with a RINGMAT. The notes that follow are therefore written for those who wish to go further in extracting maximum pleasure from their records and to explain what is happening, and then what is required, if it is felt that the sound could still be improved upon. The ANNIVERSARY series of RINGMATS, in common with the 330 MkII and MkII XLR, has an extra ring on the underside about 2¼ inches (58mm) from the centre of the spindle. As it is important that this extra ring rests securely on the platter, gently press the RINGMAT down onto the platter by applying slight pressure on top of the RINGMAT immediately above the small underside ring. Only the three underside rings of the RINGMAT should rest on the platter, so do not press the RINGMAT down so hard that any part of the paper substrate (disc) itself is pushed down onto the platter. In the case of those turntables having a split platter, such as certain of those from Linn, Roksan, AR, Thorens, etc., the inner platter or hub is usually slightly lower than the outer platter, often by 0.15mm or 0.3mm. So long as the inner underside ring still rests securely on the surface of the inner platter, even though it is very slightly lower than the outer platter, this should give an excellent result. However, should the difference between the inner and outer platters exceed 0.5mm, it will be best to build up the inner platter so that its surface is not more than, say, 0.3mm lower than the surface of the outer platter. For Roksan Xerxes and Garrard turntables, Ringmat Developments have developed special platter inserts for significantly improving sound quality when using the ANNIVERSARY RINGMAT and other 330 MkII models with these turntables. For more information on this matter, or to order a platter insert, contact Ringmat Developments. The aforementioned research has confirmed that a far more accurate signal, with much less distortion, can usually be obtained by having the tonearm sloping slightly down towards the back (i.e. towards the pivot). It was also found that when the stylus pressure of the cartridge was set at a point that was more suitable to the room conditions (see following paragraph) the pivot end of the tonearm needed to be between 2mm and 2.5mm lower than the headshell end. The reason for the range of 0.5mm is that the optimum setting varies from cartridge to cartridge (the foregoing seems to be good for most cartridges, typically with a nominal tracking angle of 20° - 23° ) and also from record to record, according to the thickness of the vinyl and the angle at which the record was cut; indeed, the actual variation to achieve an optimum stylus rake angle for any record is around 1mm or more, but the suggested range is typical of many records. * A plastic Shim of 0.75mm is available, if required, from Ringmat Developments.